Now, Congress is taking action by reintroducing the Freedom of Religion Act (H.R. 590). This bill would prevent the government from denying a person entry into the U.S. based on their religion and includes explicit protections for the nonreligious. More than 120 lawmakers have already signed on as co-sponsors of the bill. This legislation is building momentum and it is likely to start moving during the 116th Congress. 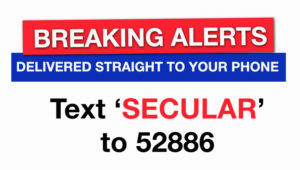 Please contact your Representative and urge them to support the Freedom of Religion Act. As a secular country, it is imperative that our policies be free of religious bigotry. The Muslim Ban established a dangerous precedent by imposing a religious test on those seeking to enter the country. Such a policy is directly at odds with James Madison’s vision of the United States as “a home for people fleeing from religious and political persecution from all over the world.” The Freedom of Religion Act will reaffirm the secular foundation our nation was built on.